Physician, public health reformer. Born: September 17, 1862, Emlenton, Pennsylvania. Married: Katherine Zuercher, 1890. Died: July 12, 1954, Jackson Heights (Queens), New York. Samuel Jay Crumbine was born September 17, 1862, in Emlenton, Pennsylvania, to Samuel D. and Sarah (Mull) Crumbine. He worked in Cincinnati, Ohio, as a prescription clerk and then in Spearville, Kansas, operating a drug store. He returned to Cincinnati and graduated from Cincinnati College of Medicine and Surgery in 1888. He moved to Dodge City to establish his medical practice, and married Katherine Zuercher in 1890. Crumbine was the model for the character of "Doc Adams" played by Kansan Milburn Stone on the television show Gunsmoke. Crumbine was appointed to the State Board of Health in 1899 and became part-time secretary and executive officer of the board in 1904. By 1905 he had adapted a device called the fly bat to become the flyswatter and he encouraged the public to “swat the fly” to combat the insect’s spread of disease. Two years later Crumbine gave up his private practice and devoted his time to public health, initiating a vigorous campaign in Kansas. The spread of tuberculosis was Crumbine’s target for two campaigns. 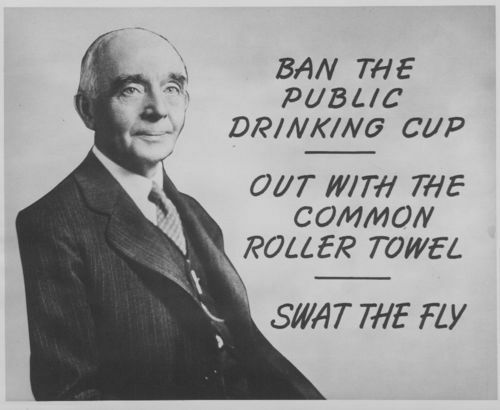 One was to replace the "common" drinking cups on railroads and in public buildings with paper cups. He convinced brick manufacturers to imprint the slogan of another campaign, “Don’t spit on the sidewalk.” The bricks were widely distributed around the country and beyond. These campaigns helped Crumbine gain an international reputation in the field of public health. Other campaigns included replacing reusable roller towels, often used on railroad trains and in other public areas, with disposable paper towels. Crumbine also warned against misleading labels on food and drugs. He authored Frontier Doctor: The Autobiography of a Pioneer on the Frontier of Public Health, which described his medical practice on the Kansas frontier in Dodge City. In 1911, during his tenure on the State Board of Health, Crumbine was appointed dean of the University of Kansas Medical School. He left Kansas in 1923 and moved to New York where he served as executive director of the American Child Health Association. After retirement in 1936 Crumbine moved to Long Island, New York, but returned to Kansas for speaking engagements on several occasions before his death, July 12, 1954. The Crumbine Award was established in 1955 in his memory and is awarded each year by the food and drug industry to encourage public health. View primary sources related to Samuel Crumbine in Kansas Memory.